← Why Do Tryptans Sometimes Work & Other Times Don’t for Migraines? Posted on June 2, 2014	by Angela A Stanton, Ph.D. It seems that today the words “migraine” and “serotonin” are synonymous. Have a migraine? Take a serotonin pill; some type of tryptan. It is interesting to note that serotonin has very little to do with migraines even though the entire medical industry and researchers are using serotonin for migraines. So you may ask: if it is not for migraines, why are they used? Why do they think there is any connection if there is none? And what is the reason the first person ever thought about giving serotonin for migraine the first place. So let me take each question one by one and provide a short explanation to each so you don’t think you are in my university lecture. If serotonin is not for migraines, why are they used? Good question. So far the only reason I heard from doctors is that “it seems to work for some even though it was not made for it.” Great. It was not made for it… so what was it made for? Depression. Does it work for depression? About 30% of the cases yes but 70% no. Why are they still used if for the majority it is not working for either migraines or depression? The reason is that there are no other medications that can make you sleepy and comfortable enough as well as serotonin does, and when you are sleepy and comfortable, you may forget you have pain. The image I inserted here is taken from Wikipedia that explains what serotonin is good for and what it does (look for the red). As you can see, serotonin is responsible for mood, memory processing, sleep, and cognition. Of these sleep and mood are serotonin’s main functions in the brain. Serotonin is not something our body can create on its own without help. It can be released by eating foods like turkey or spending time on the sun. In both cases you will feel sleepy. Sleepiness tells you that your brain released serotonin. I do not see any “pain killer” or “for migraine treatment” listed under the roles of serotonin listed in the brain. Do you? Why do scientists and doctors think there is any connection between serotonin and migraine if there is none? This is a bit more complicated to answer so bear with me. Since serotonin needs to be released in small quantities by the brain, if for any reason it is not released, one will get restless, moody, cannot sleep, etc., but will not necessarily hurt. Give that person a dose of serotonin and she will feel great. This is one reason why it works in the case of depression for 30% of the people afflicted with that disease: their depression is caused by not being able to manufacture serotonin–but note that people in depression usually do not have migraines albeit people who have migraines can feel depressed. Being depressed versus having clinical depression are not the same though. The second part of this question is why can’t some people manufacture serotonin? And this is where we connect back to migraines. In order for the neurons to manufacture serotonin, conditions for such manufacturing must be met. If the brain is not providing the proper conditions–be it a tumor, a cyst, head trauma, or simply a chemical imbalance such that the neurons are not able to generate enough electricity to make serotonin and release them–the brain goes without serotonin. If this is the case, taking serotonin medications will fill the brain with serotonin. However, once that serotonin is used up the emptiness will return, since the brain is still not able to make serotonin. The brain needs to have all its abilities to make serotonin and all other neurotransmitters. 3. So why did the first person ever thought of giving a serotonin pill to a person with migraine? I suppose for the same reason many medicines are prescribed “off label,” which is in fact how doctors can unofficially test with untold patient volunteer guinea pigs if a drug will work for something other than officially indicated. There really was no reason for it at all. It was just a guess. So why does the brain actually hurt in a migraine? If the brain is not able to function, it complains. 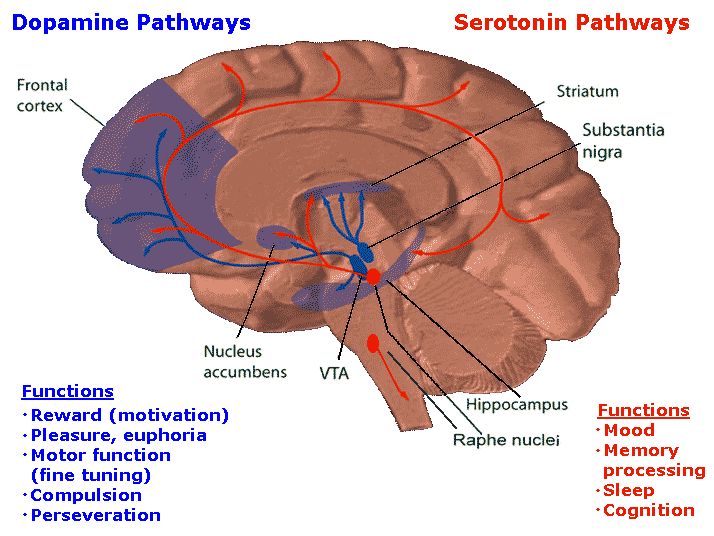 In the case of depression, because it is serotonin that is often what is believed to be missing, the brain does not hurt and in 30% of the cases when serotonin is provided, the depression improves–however serotonin is not necessarily the choice for treatment of depression since Norepinephrine hormones seem to be more related. But in case of migraines, the brain is not missing serotonin but neurotransmitters that do not work. The brain has a very cohesive network of neurons. Each neuron can have thousands of connections with other neurons–holding hand so does speak. When a particular region of neurons is not working, the connecting neurons try to wake the “sleeping” neurons up by sending electrical signals to it. If that does not work, the active neurons send pain signal to neurons whose job is to receive such pain signals and pass the pain over to you the owner of the head. Thus in the case of migraines, the pain we feel is the pain the neurons send to pain receiving neurons. The brain manufactures dozens of neurotransmitters or neuro-peptides. Some neurons manufacture more than one neurotransmitters. The brain assumes that all neurons work and so if it finds a region that does not work, it will signal you, the migraine sufferer, that something is out of order. Yes, you can take a pain killer and perhaps get rid of the pain for some length of time but that does not solve the underlying problem of why you had the pain and the non-functioning neurons the first place. Let me explain one additional very critical information. 90-95% of the serotonin is not manufactured in the brain and is not used by the brain at all. Serotonin is a hormone of digestion and as such it is manufactured by the gut for the use of the gut to assist in the passing of food via the movement of the food being pushed through. 90-95%! That means that if you take a serotonin medication for migraine pain in the head, 90-95% of that drug will affect your digestion and only 5-10% your brain–and on top of it, it may not work for you at all. This can cause serious complications for migraine sufferers. Most migraine sufferers end up with IBS (Irritable Bowel Syndrome) as a result of taking tryptans. Those who have developed IBS before migraine, may in fact have a reason to suspect a serotonin imbalance of the body and they may benefit from regulating their IBS by taking serotonin. For reasons clearly understood (by me) based on what serotonin drugs do, not one of the people who contacted me so far about migraines as a result of my migraine treatment book was without IBS (the book is available both in e-book and also in paperback everywhere but here I link you to amazon paperback). All whom I talked to are/were taking some type of tryptan medication to reduce their migraine pains. Of the many hundreds who by now have contacted me, I so far only found one person for whom a serotonin drug actually reduced the migraine pain and no one else and she had IBS before migraines. So before you pop that next tryptan pill for your migraine, evaluate if the risks of having IBS as a result of taking a drug that can cause it is worth taking. It may not be. There are alternatives, such as proper brain chemical management, the details of which you will find in my book. I do not endorse any supplements, vitamins, or medications in my book. I endorse paying attention to your body, understanding what it needs and why and eat accordingly. When it comes to applying my recommended chemical balancing of the brain for proper voltage generation, there are no more triggers, be it weather, food, pressure, heat, or anything. This entry was posted in Interesting reading, Migraine-Blog, This & That, Thoughts and tagged doctor, drug, drug overdose, food, good eating, health, healthy eating, IBS, migraine, serotonin, tryptans. Bookmark the permalink.